Saturday- It was a busy day at work. My two favorite doctors were working, so things moved quickly. I was alone on the floor, but it was busy, not frantic. Bob picked me up and we had a typical evening. Bob is still working on the wood in the hallway. Sunday- Polly was with me, so the two of us knocked out the work fairly quickly. Still had my two favorite doctors, so it was a nice day. Bob started on the wood in the bathroom. I returned home to no door handle on the bathroom door and all the cabinets open with the doors lines up in the living room. Monday- Problem! Bob had taken down the door to the cabinet in the bathroom! It has the mirror on it! He had to bring it into the bathroom and place it on the counter so that I could get ready for work. He said he was re-thinking his plans for the day, because we wanted to get it put back up as soon as possible. We were afraid that it would fall over and break the glass. So quick adjustments while getting ready for work…. Polly was with me again. It was busy in the morning, but quieted down for awhile, before became busy again. We both were able to leave on time though. We usually close the shades when it starts getting dark, but this evening I happened to notice a nice sunset. 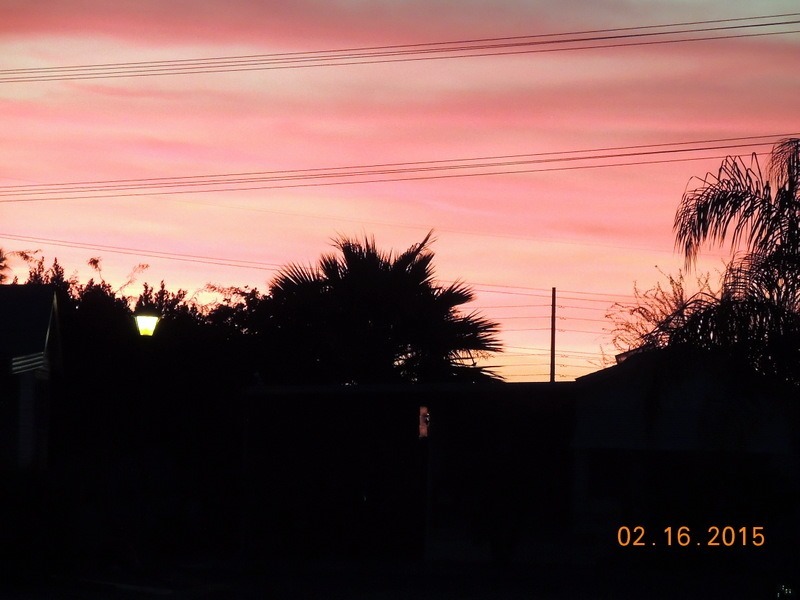 Of course, the colors are not as awesome as if you were looking in person, but Arizona sunrises and sunsets are magnificent. We have been watching the east coast weather and are thankful that we are in sunny AZ with temps in the 70’s and bright blue skies! Tuesday- I went to Mahjongg while Bob worked on the doors. The bathroom doors and drawers are so bad he decided to strip them. So it is taking longer than he anticipated. He has completed the cabinet, so the mirror doors have been back up. I returned and we went to lunch. We came home and took a nice nap. 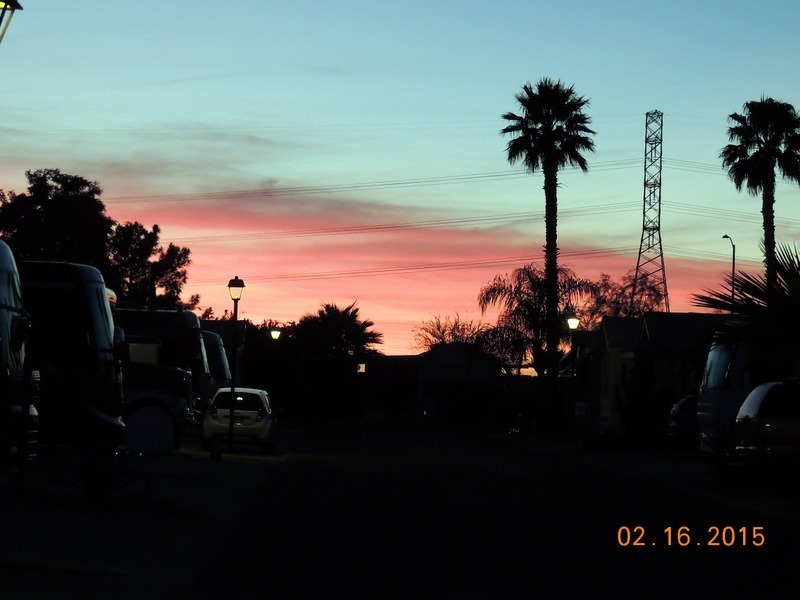 Wednesday- We did some work around the motor home and took off for Scottsdale at about 10:45. The traffic was backed up so we were a little late, but then so were Susan and Dale who we were meeting at Manual’s Mexican Cantina. The food was very good! We had a great time catching up and working on the Roadrunners Pre-Rally. We are co-chairs with them. We are going to be in charge of the games and baskets. I get to go shopping and spending other peoples money! Whoopee! Bob is going to be doing a beer tasking and that has turned out to be a real hit. We have had to expand the number of people! Thursday- Back to work. I have the new gal, Lori, working with me. I am training her to take over for me. She stayed with me until 1, then was pulled to the ER to work as the Gatekeeper. Tammara was also with us, and she took half the floor. The Gatekeeper reviews the patients for inpatient status or observation. So people, it is clear what they are per Interqual guidelines. Others, it is iffy, so she sends to the MDCC Doc’s in Mesa or our MDCC, Dr. Mukundan, who reviews and makes the final decision on admission or observation. Bob is still stripping the bathroom doors. We had a typical evening. Friday- Lori and I were alone together on the floor. It was a busy day and we ran most of it. She is doing very well and will be a good fit on the floor. We went to happy hour when I arrived home. One of the ladies had taken some of the lemons and squeezed the lemons and lemon zest into a bottle of vodka. Then she let it set for a week, then she removed the zest and added water and sugar. She let it set a few more days. Wow was it tasty! We ate dinner, and watched TV with me falling asleep in the recliner.